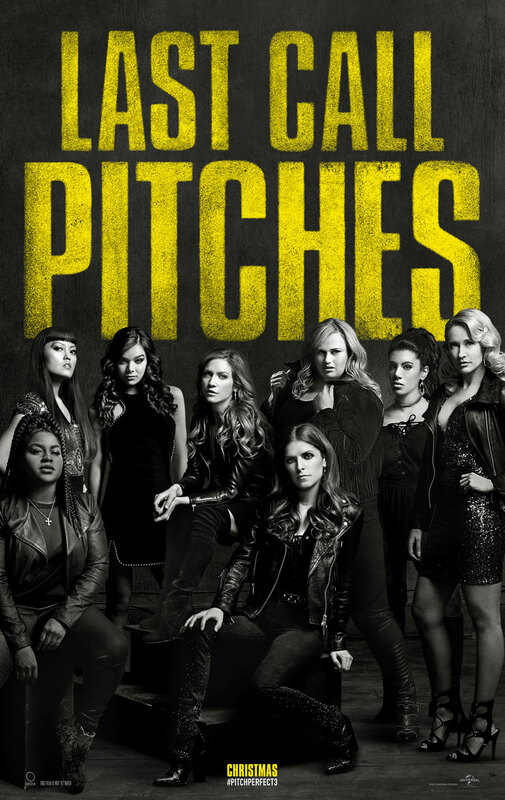 The first trailer for the third Pitch Perfect film has arrived and is interesting as it is really the first thing we've seen concerning the third Pitch Perfect film. Little has been discussed, especially story, when it comes to this trilogy capper in the unexpected a cappella franchise that began humbly enough in October of 2012 when director Jason Moore delivered a fast-paced, genuinely funny, and inventive teen comedy that capitalized on both the history of the genre itself and the idea you really can do anything...even if you're in an a cappella group. With the second installment Elizabeth Banks (who also co-stars in all three films) took over the director's chair and drove the film to an opening weekend that made more than the original film made in its entire theatrical run. The Pitch Perfect series is one that was born on the back of good word of mouth and a timely home video release where teenage and college-aged kids caught the effortlessly fun film over their Christmas break and replayed it again and again in their dorm and living rooms. The point being-it became fun and familiar to hang out with this group of girls and their friends and frenemies and thus any subsequent adventures where audiences could again get some time with them would be default hits-especially if the same irreverent tone was kept intact. With this third film, Step Up All In director Trish Sie has taken the helm with series writer Kay Cannon (New Girl, 30 Rock) still handling script duty. Personally, I'm very much looking forward to what this third installment has to offer as there is always a very distinct shift in tone between the first sequel and the second meaning it can no longer be as much of the same as audiences hoped part two would hit. With third films we like to see real progression in our characters as well as their story come full circle so that we get some closure and promise as to where these individuals may go from here as it is likely that, even if we get more Pitch Perfect movies, many of the original players won't be involved or in the same capacity from this point on. That said, this initial trailer looks really fun and I'm happy to see the entire gang come back for at least one more round of a cappella antics. Pitch Perfect 3 stars Anna Kendrick, Hailee Steinfeld, Brittany Snow, Anna Camp, Rebel Wilson, Alexis Knapp, Ruby Rose, Hana Mae Lee, Kelley Jakle, Shelley Regner, Ester Dean, John Lithgow, and opens on December 22, 2017. Synopsis: Now graduated from college and out in the real world where it takes more than a cappella to get by, the Bellas return in Pitch Perfect 3, the next chapter in the beloved series that has taken in more than $400 million at the global box office.